I’ve been driving a Tesla Model S for about 2 years now and have been all over Europe on multiple road trip vacations, short day or weekend trips and have used the car as my daily driver. In these past 2 years, I’ve learned a lot about driving this car and I feel I pretty much know the ins and outs of it (there is always more stuff to learn though). 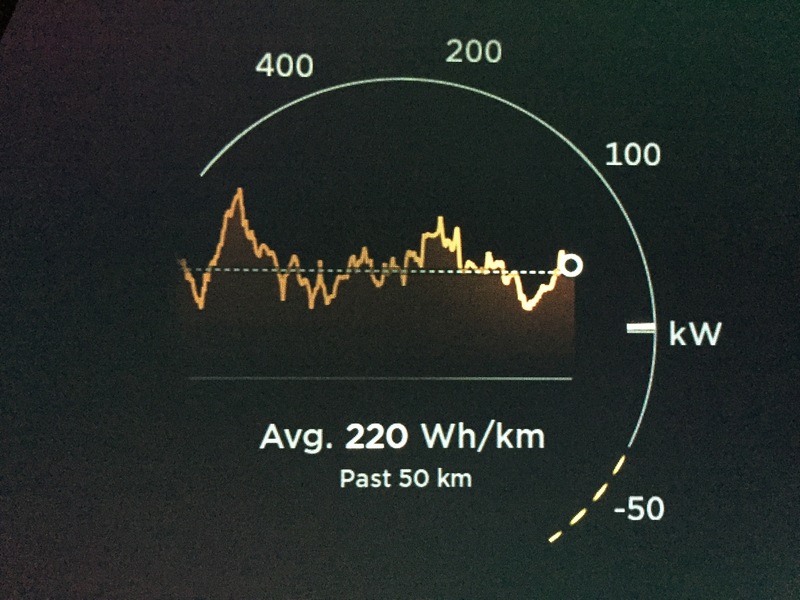 Some information seems so basic to me that it baffles me not all Tesla drivers have this knowledge. Part of that is down to the fact that the community usually has more information than the Tesla sales or delivery people (community at work here), but also due to the fact new drivers are in my humble opinion not educated enough on the practical points when taking delivery of their car. That’s why I wanted to write a series of blog posts over the next couple of weeks to draw up some common assumptions and answer some questions I regularly get asked. Why is my supercharging speed so slow? This is a very common one I read on all forums. People expect to have the maximum charging capacity available all the time and throughout the entire charging cycle. However, there are many factors at play here which have an influence on charging speeds. The first one is the fact that the car protects the battery from overcharging. A good analogy for supercharging the battery is the challenge to fill a glass with water as quickly as possible and until the very edge of the glass, without spilling a drop. At first, you will start to pour very rapidly and the glass will start to fill at a high rate. But as the glass fills, you become more careful, pouring very slowly at the very end as to not spill anything. 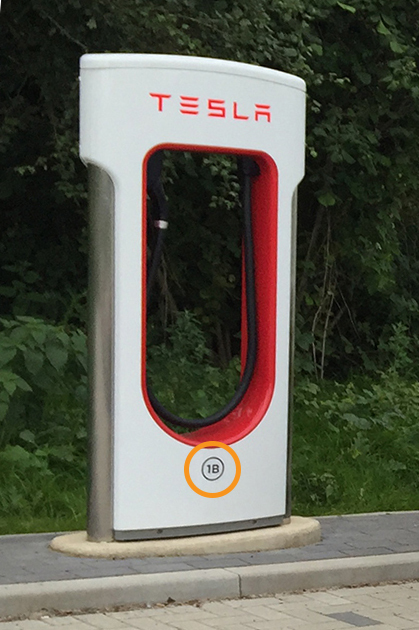 That is how supercharging works too: when you start with a low state of charge, in ideal conditions you will get a high charge rate, up to 120kW even. But that soon starts to drop to about 90kW, where it stays for a while, dropping to 50kW or less as the battery reaches 90% or higher. Practically, this also means that if you start charging at 50%, it will charge a lot slower than when you start at 10%. 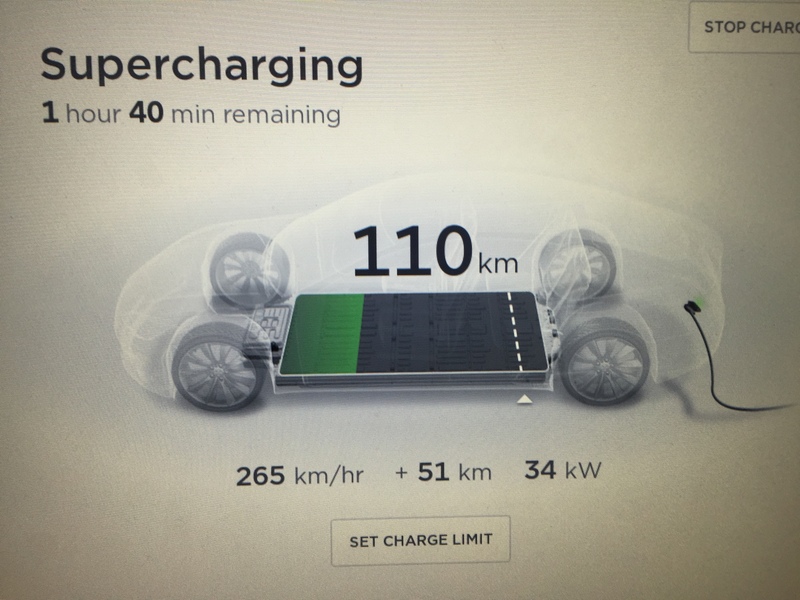 That is why you should always try to arrive at the supercharger with a low SOC (State Of Charge) and only charge enough to get to the next supercharger + some margin, in order to arrive there with a similar low SOC. That way you get the fastest charging times and therefore also the fastest total travel time. Secondly, temperature is also important. A cold battery can’t handle the high charge rate very well. So, the first few minutes, it will gradually build up the rate until the battery is warm enough to handle the real supercharging. Not much really you can do about this, except arriving with a warm battery. In summer, this will never be a problem, but in winter it can be. Usually it takes about 50km at least to get the battery nice and warm and usually you can driver further than that before needing to supercharge (since it is not meant for daily driving purposes, but rather long distance driving). There are cases and circumstances where you have no option to charge overnight or during the daytime and you have to charge to get to your next destination. Then there are some things you can do to help you get a warm battery more quickly and thus arrive at the supercharger with a more optimal battery temperature to get a faster charge rate quickly. The first option is only available when you have a PD-version of the car (P85D, P90D or P100D).< Those cars have the “Insane” or “Ludicrous” button under the “Driving” tab of your settings screen. Under those buttons, you will find a clickable text that reads “max battery power”. This is meant to heat the battery to a higher temperature than normal so the impedance is lower and more Amps can be drawn out of the battery at that time. This gives you the maximum performance of the battery (as the text already indicates), but it is not that healthy for the life of the battery if you do this frequently, because it will take it out of its comfort zone. However, it does help warm up the battery more quickly than simply driving the car. And if you turn it off, once you see you have full regen available again, that means the battery is warmed up and you’re not exceeding the comfort zone. You should be fine then, since this should also only be an occasional situation. The second option when not able to drive a longer distance to warm up the battery, is to use regen a lot. Regen is what is referred to when braking the car but without touching the brakes. The car will slow down quite heavily from reversing the polarity of the motor, thus magnetically slowing down the motor’s rotational velocity, resulting in a braking force. By doing this, the motor effectively becomes a generator and starts to store energy into the battery. This in turn generates quite a bit of heat in the battery and therefore will bring up the temperature to a point where it can handle higher charge rates faster. This effect is not immediate and does still require quite bit of regen to have the desired effect. A third option is to accelerate the car heavily for a few times. Drawing lots of current out of the battery also generates enough heat to gradually increase the temperature. Of course, you can’t always do this in traffic. So, that is definitely a drawback. Another drawback of this method is that “launching” the car takes its toll on the range that is left due to the high energy consumption and also on the wear and tear of your tires. Tesla cars have a lot of torque and will eat tires quickly if you do this often. Another reason why you won’t have the full charging capacity all the time, is the fact that the stalls are usually paired on a single transformer. Next time you visit a supercharger, take a look at the bottom of the stalls. They will have numbers like 1A, 1B, 2A, 2B, 3A, 3B, … These numbers indicate how they are paired up to a single transformer. So 1A and 1B share the same transformer. And usually, they are aligned by number, so 1A is right next to 1B. That is why you frequently see Tesla cars parked with a stall in between each and every one of them. But there are some superchargers where the As and Bs don’t alternate, but the numbers do. So, for example, you will have 1A, 2A, 3A, 4A, 1B, 2B, 3B, 4B. That means that when you arrive at a supercharger, you should look for the stall numbers and make your decision on which one to pick based on which number doesn’t have anyone charging on. Now, what does this mean that they are shared? Well, assume you have a transformer for stall 1A and 1B. It can handle 135kW of power going out to the pair. If I’m arriving there first with a fairly low SOC and hook up to stall 1A, I will get about 115kW of power. If you arrive a bit later and hook up to stall 1B, that means there is only 20kW of power left that the transformer can give to your car and you’ll be charging very slowly and probably will get frustrated with the charging speeds. This doesn’t last, because, as I’ve explained before, the charging speed on my car will start to taper off as my SOC increases. As that happens, your car will also gradually receive more power and the balance will shift eventually to a point where I’m taking 50kW and you have 85kW available for your car. If I leave early, then I will disconnect and after a minute or so, you will receive the full power of the supercharger. That is why you should try to find an empty stall pair and take one of those to get charged faster. Or, if that is not possible, try to guess which car is nearly done charging, because hooking up to the second stall of that pair will get you the highest charge rate available. Now, how do you know which car is nearly done charging? That is not always possible, but if people are sitting in the car, you can see the green LEDs near the charge port blinking. The faster they blink, the lower the SOC of that car and the more power it is already drawing. So, try to find a slow blinking car and hook up to that pair (usually next to that one). If the cars are locked, you won’t see them blinking and then it’s anyone’s guess which one will be done the quickest. The last factor is this list is not just one factor, but can be a multitude of things. Tesla doesn’t control the power that is supplied to the supercharger transformers. There may be quality issues in the power delivered in the sense that it is not stable. This can happen in more remote regions and regions with heavy industry nearby. These are a few factors that will definitely have an impact on supercharging speeds. That means not every supercharger location will charge your car at the same speed. Keep that in mind when visiting superchargers and you will not be so worried next time you see your car charging at only 50kW or so. This is perfectly normal and there is nothing wrong with your car. Unless it never goes higher than that of course and then you’re best to call Tesla Support to check up on it remotely or maybe call your Service Center to make an appointment to have it checked out. Should this article have been helpful and you want to buy a Tesla, please use my referral code http://ts.la/steven1007 and get free supercharging on your new or inventory car. As certified class 1 drone pilot in Belgium, Silver Lining is expanding its business into drone photography and cinematography for all kinds of occasions (weddings, events, photo shoots, music videos etc.). One crazy trip and a new world record!